Mark: Hey, it's Mark Bossert here. Producer of the Pawlik Automotive podcast. We're here with Mr. Bernie Pawlik in Vancouver. How are you doing this morning Bernie? Mark: So, 19 time winners of Best Auto Repair in Vancouver and 37 years of repairing vehicles and maintaining vehicles in Vancouver. We're going to talk about a 2002 VW Jetta TDI that wouldn't start. What was going on with this vehicle? Bernie: Yeah. So, this vehicle was towed to our shop with a no start condition. The engine would crank over fine, but it just wouldn't catch, wouldn't start. So, we did some diagnostics on it, as we usually do, and found a few interesting things. Mark: What did you find during your diagnosis? Bernie: Well, the first thing is, is the gas gauge was reading fully empty and that kinda had us concerned. So we talked to the owner and he said, "Well, the gas gauge is kind of intermittent. Sometimes it works, sometimes it doesn't." There was definitely an issue going on with the gas gauge sending unit. We did verify, in fact, that we couldn't pull any fuel out of the fuel tank. So, our first step was to find out is it actually in fact out of fuel. We did verify that it was out of fuel, but there was another interesting thing that we found known addition to that too. Mark: So, what was the extra problem that you found that was more than just fuel? Bernie: So, we found, actually, that even after we'd added fuel the fuel tank strainer was blocked. That sits, fortunately for the client who had a malfunctioning gas gauge the strainer and the gas gauge sending unit are all one piece. We pulled ... You can access this through the rear of the vehicle. You don't have to drop the fuel tank as you do in a lot of vehicles. We were able to access the fuel pick up unit with the sending assembly, gauge sender assembly through the back seat of the vehicle, under the back seat and remove it. We found the strainer was plugged full of debris, which is not an uncommon issue on these vehicles. It does happen from ... not a lot, but from time to time. So, we'll just go into some pictures right now. So, there's a nice specimen of a 2002 VW Jetta TDI. And onto pictures ... So, this is the fuel sending unit. This is the old one in the vehicle. And this is a sort of bowl where the fuel sits, and fuel is stored in here and it's picked up and sucked through here. You can see all of this black debris. That has basically blocked off the fuel system from sucking any fuel into the fuel pump, the fuel injection pump. So, the new unit ... We'll get to right here. That is basically the new fuel sending assembly. So, this is the whole unit together. This is the gas gauge sender. So there's a float here, and this floats up and down in your gas tank. You can see its got a little arm, and this'll float, move up and down depending on how much fuel's in the vehicle. This little electrical rio stat here will send a signal to the gas gauge and then you'll know how much fuel you have. So this item wasn't working. Also, the strainer which is inside here, that was the picture you were looking at, sort of the view looking down here. That's been replaced so kind of killed two birds with one stone in this case. Mark: So, I've had a couple of newer versions like this vehicle. They were a little bit less forgiving, perhaps, because they were high pressure fuel systems. But I definitely had issues with running bio diesel in cold weather. Was there any kind of issue in that regard? Like, why was there so much dirt in there, or debris? Bernie: I mean ... I think it's just that it accumulated over time. I'm not really certain how that dirt got in. But, I mean normally fuel is filtered when you buy it but it's never 100%. That's why vehicles have fuel filters. Although, interestingly enough most gasoline engines, actually for the last 20 years or more, have actually had ... The fuel filters been largely eliminated as an extra piece. The actual filtration happens right in the gas tank. Rarely with a gas engine do we ever see any problems. Because I think the fuel processing system and delivery is just so clean that it actually works that way. In the past, you know, it wouldn't have been so. But, with diesel I guess, you know obviously there's some debris and things have accumulated over time. These vehicles usually last a long time too. So, you know, it's a 2002 that makes it, what, 16 years old. You know, there's quite a few kilometres and years of pumping fuel through the vehicle. So, the debris just builds up. Mark: And as you mentioned, this is a 2002 Jetta. How is it for reliability? Bernie: These are still really good vehicles. The fuel system is ... it's more mechanical in this version than it is on the newer ones. More mechanical, less electronic. It works really well. It's kind of a nice, sort of, era where the blend between the fully mechanical and the more electronic diesel's ... It's kind of half way in between that. It actually works pretty well. I mean, these cars are getting ... you know, they don't have as much value as they used to. So, repairs can get expensive. But over all they're still pretty good cars. The actual base engine itself is really solid. It just, often the fuel system starts to cost money when you get to this age of the vehicle. But, this was a fairly simple repair and not to costly. Mark: There you go. If you're looking for service for your Jetta, TDI or otherwise, in Vancouver the guys to see are Pawlik Automotive. You can reach them at 604-327-7112 to book your appointment. You have to book ahead, they're busy. Or, check out their website pawlikautomotive.com. Our You Tube channel, Pawlik Auto Repair. We've got hundreds of videos on there, or of course hopefully you're listening on our lovely new iTunes podcast here. Thanks Bernie. Mark: Hi, it’s Mark from Top Local, we’re here with Bernie Pawlik, Pawlik Automotive in Vancouver, Vancouver’s best auto service experience, servicing and repairing, maintaining cars in Vancouver for 38 years and 18 time winners of Best Auto Repair in Vancouver as voted by their customers. How’re you doing Bernie? Mark: So we’re going to talk about a 2007 VW Toureg 3.6L, this is one of the VR6 engines and you had to do a valve cover replacement. What was going on that you needed to change the valve cover? Bernie: What was going on, was this vehicle came to our shop, engine wasn’t running quite right. We did a scan and diagnostic on the vehicle and found there was a trouble code for a lean fuel condition and traced that to being a leak in the crankcase ventilation system and the crankcase ventilation valve happens to be built inside the valve cover. So that’s why the valve cover needed to be replaced. It’s not a separate unit. It’s all a modular piece. Mark: Ok, that sounds a bit strange because a PCV valve is fairly regular maintenance item. So it required, why would they change it to make that simple part be part of the integral to the whole valve cover? Bernie: Well I’d say why was probably from a manufacturing point of view. A lot of things on vehicles are done on a I call it a modular fashion, in other words, they kind of look at things and ok the crankcase ventilation valve, kind of part of the valve cover sits there, why not just put it all into one unit and when we build the engine we can just stick it all together and it makes it easy. So from I think a manufacturing perspective, it makes it a whole lot easier than having a separate component, like a simple PCV valve. Where you could actually unscrew the thing and replace it which would be like really simple and which used to be and it was the kind of part that a lot of times you go, even if you go to a quick lube shop and they’d go, oh there’s the PCV valve on top of the valve cover. Let’s just put one of those in because it costs $5 bucks and we can make an extra couple of bucks while we’re doing an oil change and it actually services that part. Nowadays it just gets stuck inside. Now granted, these are a little more just, a little more complex to the simple PCV valve and they flow a little more air, but really yeah why not put in on the outside and make it a whole lot easier to fix. Mark: So you have some pictures? Bernie: Yeah I do. Let’s have a look at some. Nice little 07 Toureg and we can go into the engine. So there’s the engine. Again, as you’re saying Mark, it’s a VR6 design engine which has been around for a while. Unique Volkswagen concept which works quite well, very compact for space and you only have one cylinder head which is kind of neat which instead of having a V which has two. Anyways, the valve cover is located here underneath the intake manifold and there’s a lot to get off to do this job. Manifold is not just a simple replacement. It has a direct fuel injection system and two fuel rails hidden, one under here, one further down, if you can see my mouse pointer, these both need to be removed in the process. And then the intake has to come off and then of course, all the ignition coils, the spark plugs, sorry just the ignition coils and then you have the valve cover located right in the middle. So it’s a few hours worth of work. It’s a lot to be done. Then we look at the valve cover. There’s the valve cover. This is the old one, it’s off and of course they don’t sell parts. The piece is located inside here. This is the breather hose, it goes off to the intake, and this is the inside view of the valve cover. So this is, that breather pipe is over here, there’s a valve in here and an air intake section here. So what will happen is the valve, it’s a rubber diaphragm valve sitting in a very hostile environment with noxious crankcase fumes and oil vapours and just really, just stuff that’s really hard on rubber and eventually the rubber diaphragm deteriorates. It rips a hole and it’ll end up sucking a lot of air through the engine. So that’s what causes the lean fuel condition. The engine’s actually, the system sucking air that it’s not supposed to and also cause a lot of pressure and suction in the crankcase as well. so anyways, that’s what we, that’s a little view of everything in there. Mark: Ok, so let’s do a little comparison. The old PCV valves, maybe even from the 70’s, how often would those be, how often would you change those? Bernie: Well, probably, they used to get changed probably once a year when you do a tune up on an old car like that. But how often do you really need to change them? Probably every 2 to 3 years. They would basically, the most thing would go wrong with those type of PCV valves, is that they’d end up getting plugged up with sludge and carbon deposits, you know as the crankcase gases are flowing through it eventually it leaves vapour on it and they’d end up plugging up. So that’s what would cause that. Mark: And what about these new style ones, where that PCV valve is incorporated right into the valve cover? Bernie: Well this vehicle’s 10 years old and it’s failed, so that’s kind of a , I would say, probably the average life span of these, but VW isn’t the only manufacturer of these. I mean there’s a lot, we did a Chevy Cruze a while ago that had a similar issue. Not that old of a vehicle, probably 100,000 kilometres, I don’t know 3 to 5 years old vehicle and the same kind of issue. And again, on that one, you have to change the whole valve cover. So that’s kind of the way a lot of auto manufactures are going. It’s all modular and some of them don’t last as long. Fortunately the Cruze was a substantially cheaper job than it is to do a valve cover on a Toureg. Bernie: Yes, yeah the advantage of having your business on a main road. Mark: How are these 3.6 litre VR6 engines for reliability and servicing? Bernie: Well as far as reliability, they’re pretty good. You know, we don’t do a lot of, you don’t find a lot of things go wrong with them, I mean this is sort of one of there major things but they are potentially and extremely, I should say as far as servicing, I mean the oil changes are a bit of a pain to because the oil filter is located under the engine in a tricky to access spot. This particular engine actually is used on the Porsche Cayenne and An Audi Q7, so you’ll find a few different platforms of vehicles. But they’re all a little bit of a pain to access the oil filter. So the oil changes are a bit more work than they could be and there’s a lot to go wrong. I mean, there’s a lot potentially expensive repairs. The timing chain is on the back side of the engine so if it ever fails, it used to a lot in older VR6’s, not on these, but the old VR6’s, the timing chain failure was common. You have to pull the engine out to get at it or take the transmission out to access the timing chain. So it’s a lot of work. I don’t know why they built these things backwards but I guess the expectation is you’re never going to need the service it which is my thinking or if you do well too bad you’re going to have to pay for it. But other than that you know, they are actually quite a reliable engine. Mark: So basically the VR6, just to digress for a second, is a V6 squished together in to still alit bit out of a line, but the cylinders are sort of, I don’t know how you describe it without showing a picture of it, they’re just sort of squished together but offset from each other? Bernie: Yeah a typical V engine might be you know, I’ll just use my hands for example like a lot of V engines would have the cylinder banks would be like you that sort of 45 degrees and there’s a variety, some are wider, some that are narrower. But a VR6, what they’ve done is they’ve actually, I think it ’s a 15 degree bank. It’s very close. They kind of offset the cylinders so that one sits sort of unaligned. So they just kind of used the open space, it’s actually brilliant engineering and so they’ve incorporated the V engine into one cylinder head, with one cylinder head, one engine. Well you know they all have one engine block but just one cylinder head to do the whole job. So it’s a pretty neat feat of engineering and really it generally, they’re pretty reliable over all. As I said, the older VR6 the timing chain failure was a common thing but they seem to have eliminated that as an issue. So yeah it’s good, it’s compact which is a neat thing about it. It doesn’t take up a lot of space which is kind of a brilliant part of it. Mark: So you get the power within a smaller space basically? Bernie: Exactly, exactly and that’s important in modern cars. When you look, you know, they build a car smaller, there’s less hood length, there’s a lot more accessories and things stuffed inside. So it makes sense in a modern car whereas in olden days, you’d have hoods that are like you know, a 4 by 8 sweet of plywood would fit under there, you could fit that under there. I had a friend that had a Plymouth Fury, a 1968 Fury had a straight 6, one of those famous Dodge slant 6 engines, you pop the hood and there was enough room to stick a second engine beside it. So much space, you know it was crazy. But not like that anymore. Mark: Hi, it’s Mark from Top Local, we’re here with Bernie Pawlik, Pawlik Automotive in Vancouver, 38 years of repairing cars in Vancouver and 18 time winners of Best Auto Repair in Vancouver as voted by their customers. How’re you doing Bernie? Mark: Fantastic, because I know you were a little bit sick earlier this week, so we’re talking about an old VW, a 21 year old VW Golf that you had some work on, what was going on with this vehicle? Bernie: This vehicle had a really bad clunking noise coming from the rear and the rear struts were worn out so, and in all fairness has been a client of ours for quite a long time and we knew the struts were wearing but I want to talk about this today because I mean just the amount of wear on these struts before the replacement was horrific. It’s just very interesting to kind of look at and just talk about the struts and old VW’s. Mark: So there’s lots of noise, what else was going on when the vehicle was being driven? Bernie: Well mostly there was just noise, I mean when you drive the vehicle and I mean any of the little minutest amount of a bump, I mean even a microscopic bump there’d be a creak and a bang in the back of the car. As I mentioned it had been going on for quite some time but this person has been a regular client for quite a while and being an older car, it needed a lot of work. So we fixed up what needed to be done, the priority items and the struts were not on the priority list initially by they certainly became high on the priority list. Especially when the vehicle was in for the last service about a month ago, it had a bad wheel bearing problem which is pretty severe in the rear. So we serviced that, fixed all that up and we noted that the rear struts of course had deteriorated so badly in fact you could take the back wheel and rock it back and forth like quite a lot. And you could see the strut, there was play in the strut, just a massive amount of movement. So I said, hey you know, you’ve got to fix this as soon as possible, so recently as soon as possible happened and we fixed it. I’m going to share a couple of pictures because when we took it a part, it’s just interesting to see just how badly worn a part like this can be. I’m going to actually start with a picture of the repaired strut. So this is what a good strut looks like, this is the actual strut part that got replaced. You can see this rusty piece that’s the coil spring. In this case, we did not replace it but this accordion bellow piece here was replaced and there’s a piece up here called the snubber which is a little like a foam cushion when you, if you hit a bump to hard it’ll actually prevent the top of the strut from hitting the strut plate and then what’s not in the picture is the strut place which is just out of the picture, and that’s what mounts the strut to the vehicle. This forms a sort of top part of suspension, it keeps the wheel from you know flopping in and out. Plus it also provides the shock absorbing spring motion. So that’s why I like a MacPherson strut. It’s a pretty unique component. It actually eliminates a lot of parts that you find in other suspensions. Now here’s the broken part. So I put a couple of nice arrows here, now this is actually at the bottom, we removed the bottom mounting and basically the strut just fell apart. You can see the spring has slipped down and normally this wouldn’t happen. The strut would actually stay in place but because it’s so badly work at the bottom of the strut tube has actually broken off inside. So this is the outside tube and this is the piece that moves up and down when you hit bumps. The red arrow basically sort of points to the separation of the two components and then the yellow, I’m just pointing at the tube and you can see this ugly brownish colour, there’s oil inside struts and as they wear, they leak and of course water gets inside. That’s just an emulsified oil with a boiled water mixture, it’s just kind of ugly. So a good indication if your struts are actually wearing is if you know, you see actually fluid, like an oil seeping out of the strut. That’s a good sign the struts are on their way out and need to be replaced. So there’s a couple photos of what we saw. I don’t have a video of the actual, of the initial movement of what was there but trust me, it was pretty scary. Mark: And is this a difficult replacement? Bernie: Not really too difficult on this vehicle. It does involve some removal of the interior to access the upper strut bolts but the job itself is not too difficult. This strut came, it’s not available in bits and pieces. We had to actually order whatever parts we needed which is why the spring is still old. But what we do in a lot of newer cars and it’s available for many models, a part they call a Quick Strut or I think other manufacturers have different names for it but that’s Munro’s name a Quick Strut. What it is is a complete assembly. It’s the strut, it’s the upper mounting plate, it’s the coil spring, everything is brand new. So you just unbolt the assembly, bolt in a new one and you get all the new parts, so it actually makes for a really good job. Probably a little more expensive than replacing bits and pieces but then you’re not going to forget something and find later, of it’s making a little clunk or thump, the springs are a little soft. You get the complete job. It’s like restoring the suspension back to new. So it’s a really good option and we use it wherever we can. But in this older VW, you can only buy the strut and the mounting plate, bits and pieces. Mark: And how did it ride? Bernie: Oh much better, yeah no noise, smooth and of course safe. You know I mean what would happen is eventually if it broke apart, you know the spring would fly out, I’ve never seen it happen because nobody I’ve ever seen anyone leave that far but you know it could take maybe a little bit longer for that to happen like you know that the spring could fling out, that the wheel could flop out to the side or something like that. It could be pretty scary. But anyways, much safer, nice quiet ride. Mark: 21 year old Golf, is that, would that still be a worthwhile used car purchase? Bernie: Well it could be if I mean, first thing I would never buy one with an automatic. Like ’96 to about ’06 VW somewhere in that year range, with automatics were really problematic but if it’s with a standard transmission, well maintained, you know it’s obviously not going to be a very expensive car, but you now if you’re looking for something inexpensive it could be a decent used car. Again with a mechanics inspection. Mark: Good morning, this is Mark at Top Local. We're here with Bernie Pawlik, Pawlik Automotive in Vancouver, the world famous Bernie Pawlik. They are 18 time winners of Best Auto Repair in Vancouver. Eighteen times, as voted by their customers. How are you doing, Bernie? Mark: We're going to talk about a ... We have a weird glitch. I'm going to freeze the camera to you. We're going to talk about a 2006 VW Jetta, a TDI. This is a unique kind of version of this vehicle that was only available in 2006, I think. Is that right? Bernie: No, there was a few, a couple other years that I, off the top of my head I can't remember the exact, but not much as 2006. There was only two or three years in and around that. Mark: So what was happening with this VW diesel? Bernie: A vehicle came to our shop and it was running rough, had a lot of noises coming from the engine. It was pretty apparent within a short drive there was something pretty serious going on. You know, it had a slight misfire but there was ... You know, diesels are always noisy, but there was just this excessive noise that you could tell wasn't right with the diesel. We did some diagnostics on it, and what we found was that the cam shaft was worn very badly, cam shaft and lifters. Mark: So what kind of diagnosis did you have to do to get the that point? Bernie: The initial diagnostic with the scan tool, extracting codes, and off the top of my head, I can't remember all the exact codes we had. I know there was one for glow plug, which is relevant. Not relevant to the issue, but there was at least one or two misfire codes, which indicate there's a problem with the cylinders. After that, with that level of noise, it's really a matter of listening, where is the noise most present and then taking things apart. So we pulled the valve cover off and that where we discovered the cam shaft and lifters were extremely badly worn. Mark: Okay, so what ... I've had one of these 2006 TDI Jettas that was pretty reliable. What could cause this kind of severe wear on the cam and lifters? Bernie: There's a lot of, I wouldn't say controversy, but opinion on it is people using the wrong oil is one of them. This engine's kind of unique. It uses ... The fuel injection system in this engine uses an actual injector that's driven from the cam shaft and the high pressure fuel is actually delivered into each injector from the cam shaft. There's an extreme amount of pressure on the cam shafts that isn't present in a lot of other engines. Using the right oil, I think VW spec 505.01 is the prescribed oil. It's usually a 540, I think there's a 530 as well, but anyways, you need to make sure you use that spec of oil. Even with that, if you go too long between oil changes, that always causes excessive wear, and some people have even said that it's just the design of the engine is just vulnerable and weak, anyway. This vehicle did have over 200,000 kilometres on it, so that's a pretty fair amount of time, in all fairness, but it is a pretty common problem having these cam shafts wear. Critical to use the right oil, of course, and change your oil at the right interval. Mark: So, I know my own TDI had over 200,000 kilometres before I traded to a 2010. Do you see this issue often with these engines? Bernie: You know, we actually haven't seen it that often in our shop. It actually seems like a lot of the TDIs we work on seem to be a generation earlier than this, or a lot newer than this. We haven't seen a lot of this, but I'm certain that we're going to see a lot more of it, because there are a lot of these engines around, a lot of these cars, and they still have good value and worth keeping. It's out there, it happens a lot, and sometimes there's a first for everything, so this is one of our first ones with a worn out cam. But it's out there, and something to be cautious about if you're buying a used Volkswagen, make sure it's running properly and it's in good shape and well maintained. Mark: So, an expensive repair? Bernie: It is, yeah. It's an expensive repair. It's a lot of labor. This one needed timing belt to be replaced at the same time, too. It looked like the timing belt was very old and probably hadn't been done. My guess, the owner of this vehicle had bought the vehicle recently and it probably hadn't been very well maintained, would be my guess. Again, the key, as I said, if you're going to buy a used one, if you can buy it from someone who's got all the oil change records, and they're all done within, say 10,000 kilometres, they've all used the right oil, that would be a pretty important thing to look for. Why don't we have a look at a few photos right now. Start with our car, there's the '06, nice red TDI Jetta. We'll go right to the cam shaft. This is the cam shaft that we pulled out of the engine. Now, if you're not used to looking at a cam shaft, it's kind of, this item I'm pointing at here, this is a cam lobe for one of the engine valves, and this lobe here which is unique to this engine, drives the fuel injection pump. You have eight, it's an eight valve engine, so there's a cam lobe for each intake and exhaust valve, so there's four per cylinder. If you look, this is a cam lobe that's in pretty good shape. It's got a nice pointed end to it, but if you look at this one here, you can see the end is not quite so pointy. Some of them are ... Some of the cam lobes are not pointing at us so you don't get a good view. You can see this one here is definitely rounded off. This is one of the really badly worn ones. This one ... It's got wear, but it's still in fairly decent shape. There's also a big gouge here where the fuel injection rocker rides, and all of these had that as well. Again, a lot of wear in these areas. We're going to do a couple more close ups of the cam. This is, again a close up. This is that right cam lobe that I pointed to. You can see it's got a pretty decent point on it. That's an example of a cam lobe that's in pretty good shape. This is a cam lobe that's pretty badly worn. You can see that sort of roundness and discolouration there. That one's again not very good. What happens is ... Actually, I'll show you one more thing. This is the lifter. This is what the cam shaft pushes against to push the valve. Now, it's a little hard to see in this photograph because of the angle, but ... Unfortunately I took it on my steel workbench so it doesn't stand out so much, but this lifter, although it's got a lot of little metal scratches on it, is actually still pretty flat. But it still, it would be ... It's still worn. But this one here is severely worn. It's actually dish shaped, and it's dished so bad there's actually a hole right in the middle. It's actually worn in the middle, right through the middle. The difference between this height and that is probably 3/16 to 1/4 inch, that's how much wear has taken place on this particular lifter. There are several of them like that. That explains all the noise. That basically explains why the engine had the clacking noise, because there was so much play between the cam and the valve, that it's clacking and making a bunch of noise. Plus, it's not opening the valve properly, so the compression is lower. It's not breathing enough air and exhausting properly. That causes all the performance issues with the engine. Mark: Like always, using the right oil is essential. Bernie: Yeah. It really comes down to the correct oil, change it regularly. You can't prevent everything. Even really good maintenance doesn't prevent your car from having problems like this, which can happen eventually, but it's a very good way to ... It's like eating healthy and exercising is not necessarily going to guarantee you a long life, but it will generally happen, as opposed to being, smoking and drinking and not exercising and laying on the couch all day. Mark: There are a lot of generations of TDI engines. Is this one reliable, in your experience? Bernie: It seems to be pretty good. I said we don't seem to work on a lot of these for some reason, maybe because it's not the most common years, but besides this issue it's been a pretty reliable engine. We haven't run into a lot of problems with it. I don't know that I'd necessarily not buy one of these as opposed to something newer, but the common rail design is a little simpler. There's a little more complexity in this engine because of that cam shaft driven injector. I'd say if you can skip this generation and go with something newer, you'd probably get something more reliable. Mark: So there you go. If you're looking for service on your TDI Jetta in Vancouver, the guys to see are Pawlik Automotive. You can reach them at 604-327-7112. Book ahead, because they're busy. You must book ahead. Or check out their website, pawlikautomotive.com, or our YouTube channel at Pawlik Automotive Repair. Thanks, Bernie. Mark: Hi it’s Mark from Top Local, we’re here with Bernie Pawlik of Pawlik Automotive in Vancouver, 16 time winners of Best Auto Repair in Vancouver as voted by their customers. How’re you doing Bernie? Mark: So we’re going to talk about a 2010 VW Golf and something about the automatic transmission fluid, whats going on with this vehicle? Bernie: So this vehicle is actually equipped with a DSG transmission and the DSG stands for direct shift gearbox. It’s a sort of a hybrid between a standard transmission and an automatic, trying to incorporate the best of both worlds. I mean, the difference between the DSG versus a pure automatic or standard is it uses clutches, but there’s no clutch pedal, you just put it in drive like an automatic and away you go or you can shift it manually like a standard transmission, although it doesn’t have the same kind of stick. You either just push a lever back and forth from the gear shifter or they can be equipped with paddle shifters on most cars. So those are the differences. Now what’s different is the vehicle uses, the transmission uses these clutches, it actually uses two of them, it actually has two gearboxes built into one. To be honest, I’ve never seen the inside but I’m looking forward to the day when I do, probably pretty cool. But it basically, one transmission has first, third and fifth gear, the other will have second, fourth and sixth gear on a six speed. They have six and seven speed models and the reverse is on one of the two transmissions and so what’ll happen is it’ll already have pre-selected, say you’re starting off on the road, it’ll have already pre-selected second gear but it hasn’t engaged it yet. First gear is ready to go so as soon as you accelerate it engages the clutch in first gear and away you go and when it’s ready to shift into second gear, it’s already made the shift it just has to change the two clutches from one to the other, so the gears shifts are very fast and that’s the advantage. Apparently they can do upshifts in 8 milliseconds which is like eight thousands of a second, so that is like really really quick and that’s a lot quicker than an automatic can do. There’s also some advantages, the disadvantages of an automatic is you have your torque converter which creates some slippage, so there’s always a bit of slippage in an automatic transmission. So in a way an it’s an automatic, so it’s the best of both worlds being a standard and an automatic, and I’d say more complex. Although like I say, I haven’t seen the inside, but putting two transmissions into one with a hydraulically actuated clutches, it’s got to be expensive. Mark: So is there something unique about the fluid that this kind of pretty complex piece of machinery is going to use to be able to shift in eight milliseconds and live with all that complexity and make it work properly for a long time? Bernie: Absolutely, so Volkswagen has a scheduled service interval at 40,000 miles which I think is about 70,000 kilometres and they have that right in their maintenance schedule. In the past, a lot of auto manufacturers have been a little bit glib with their transmission fluid recommendations, like automatics, they say it’s filled for life, don’t worry about it which I know we’ve talked before which is a bunch of BS, but with this one, they’re very specific, change the fluid every 40,000 kilometres. So whey they say to do it, they’re pretty serious on it, they know stuff will go wrong. So it is a special fluid, you have to use a special, it doesn’t have to be by Volkswagen, but there is a very special fluid made for this transmission. The service also consists of replacing a filter, so you do the filter, you change the fluid and that is basically what needs to be done. So with anything, there’s lots of expensive parts inside, you don’t want it to wear out, you want it to work reliably for a long time. Mark: So again, we had to switch computers this morning so we don’t have any pictures but this was a fluid replacement on a 2010 VW Golf - was there anything particular about this vehicle that you wanted to mention today? Bernie: Well not really about the Golf, I think we just talked about the DSG service in general. Just a little history of background on the transmission, it came out in 2003 so you’ll find it on some models way back then and Volkswagen Audi uses it, so you’ll find it in various Volkswagen Audi models anywhere from the mid 2000’s right up until current. We just did a service last week on a 2015 GTI with DSG, so you know there’s, like I say it varies between car to car and it just made me realize I said 70,000 K’s, it’s actually 60,000 K’s. So since we’re in Canada, that’s the way we should be thinking, that’s the way our odometers work. Mark: Yeah, and how are VW’s on the whole these days? Bernie: I think they’re really good, I mean obviously they suffered quite a blow with their TDI and rightly so, I mean they were dishonest with the public, shouldn’t be that way when you’re selling the car and advertising it to be a certain way but I mean, there’s really nothing wrong with the TDI other than it puts out a lot more pollution that it’s supposed to. But I mean, the performance is good, the reliability of Volkswagen is really a lot better these days. Ten, fifteen years ago I wouldn’t of recommended one, like their automatic transmission had problem after problem, super expensive to repair and they died at a very young age. Those are just some of the things, electrical problems, power windows, these are the things we used to see but they seem to be quite reliable these days so I think they really upped their game and hopefully they’ll will survive their TDI and I’m sure they will and come through and make an honest product for the public. but the reliability is good. Mark: How is the reliability on the DSG transmission given that you were maintaining it on a regular basis, changing the fluid every 60,000 kilometres regularly? Bernie: Well to be honest, I don’t really know. We haven’t seen a bad one yet, I haven’t seen too many of these on a high mileage vehicle so I don’t really know what their longevity is, but I would say that based on the complexity, I mean that kind of stuff always scares me, you know when I think about what you could be spending on fixing something like this, I mean I would imagine a rebuild on the transmission like this has got to be six to ten thousand dollars. So changing fluid, the service is about, off the top of my head, it’s in the $300 range to do a service so it’s not particularly cheap but certainly not anything more than a modern automatic with synthetic fluid to do a proper flush service is cheaper. Every 60,000 kilometres is really cheap insurance. But certainly when things go wrong, there will be expensive repairs. Just change the fluid and you’ll get the best life out of it you can. Our latest featured service is a repair on a 2005 VW Touareg for a ‘Hood Open’ warning light concern. The vehicle was brought to us by a client from Kitsilano, Vancouver. Unusual repairs are a frequent motivating factor for writing these posts, and this vehicle certainly fit that criteria. 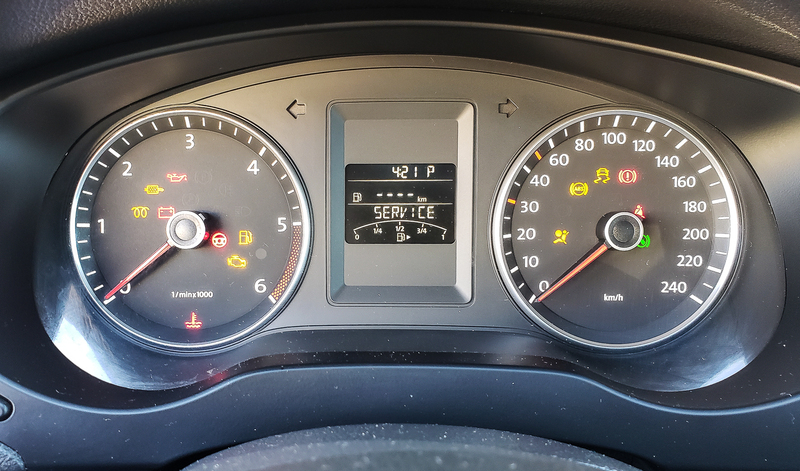 Our featured 2005 VW Touareg came to the shop with several concerns and one was that the ‘hood open’ warning light would constantly display on the dash. While the warning light was annoying the fact that this prevented the windshield wipers from operating made this a safety concern. This vehicle is designed with very close tolerances between the wiper arms and the hood; if the hood is open it will be scraped by the wipers. One of the functions of the hood switch is to disable the wipers if the hood is open. Our diagnosis began with inspections of the hood switch and hood adjustment. All was good with these components. We then proceeded further with our tests where we found the problem to be caused be a microswitch on the side of the radio. Say what? A switch on the side of the radio causing the hood open warning to illuminate. Yes, surprisingly this was the case. Why this circuit is wired in such a way is truly baffling. To me, it represents the culmination of German engineering gone too far. Nonetheless this was the cause of our concern and we found that by disabling the switch we were able to eliminate the incorrect hood open warning and restore the operation of the wipers. When diagnosing a modern vehicle you never know what strange things you may encounter. Radio from 2005 VW Toureg. This is the view of the left side of the radio with the radio removed from the dash. The red arrow points to the microswitch that was causing the hood ajar warning light to stay on. What's the relevance? I don't know; but repairing the switch fixed the concern. Today’s featured service is oil pan replacement on a 2000 VW Jetta GLX, brought to us by a client from Steveston, Richmond. This Jetta was towed to our shop with a very serious concern: there was no oil in the engine. The oil light had come on suddenly after the owner filled the gas tank at a gas station near their home. The car was then driven several blocks to their house. Checking the dipstick found no reading. Oil was added to the engine but it ran straight out the bottom. Putting the car on our shop hoist revealed the cause: there was a hole in the engine oil pan. At this point we had a dilemma on our hands and it required a conversation with our client. What we faced was a possibly, permanently damaged engine, however it might also be simply repaired by replacing the oil pan and adding oil. Knowing how long the engine had been run with the oil light on was crucial information. Apparently it had been several blocks. This is more than enough time to fatally wound an engine. We decided that the best approach would be to first remove the oil pan and inspect. If we found no bits of metal in the pan then there would be a good chance that the engine might survive. Fortunately we found nothing but a few drops of oil in the bottom of the pan. The odds of renewed life for this engine were good. Upon completion of repairs we fired up the engine. It started but ran very roughly and made a lot of noise. Given a few minutes the noise went away and the engine smoothed out: it sounded like a normal V6 VW engine. Our client was lucky. We still don’t really know the extent of any possible damage and at some point this engine may fail. What is important with this story is your oil light: if it comes on with your engine running shut off the engine immediately, or as soon as it is safe to do so. This is critical. Next determine the cause. First check your oil level and if it is low add oil 1 liter at a time until it reads properly on the dipstick. Once the level is confirmed good, restart the engine and if the light remains on tow in your vehicle for repairs. Bottom of oil pan from 2000 Jetta VR6 engine. The red arrows point to the holes in the bottom of the pan. You can also see numerous scrapes. Bottoming out your vehicle’s oil pan can cause these types of holes and cracks, and along with it sudden oil loss. If your oil warning light comes on while driving shut off your engine immediately. The VW Jetta GLX V6 engine uses an aluminum oil pan and it can be broken very easily if it hits something. Bottoming out this car is not an option. Based on the easy availability of this part from numerous aftermarket sources this concern is obviously very common. If you own one of these vehicles, be careful. Mark: Hi, it’s Mark from Top Local Lead Generation. We’re here this morning with Mr. Bernie Pawlik of Pawlik Automotive; Pawlik is an award winning auto repair and auto maintenance shop in Vancouver BC. How are you doing today Bernie? Mark: So we’re going to talk about TDI’s one of my favourites and Volkswagen is pretty famous for their TDI’s. So what makes it so special? Bernie: Well that’s a great question. I think there’s a couple of reasons but first let’s talk about the history about TDI’s and Volkswagens. The TDI engines were first introduced in 1989 by Audi. TDI basically means turbo direct injection. Nothing really fancy, just a turbocharger and the injection goes directly into the cylinder as opposed to into a pre chamber which a lot of diesels at the time had but most modern diesels are really TDI but that’s Volkswagen’s term. So the early systems used mechanical pumps but they’ve evolved into the engines that we have today. In 2009 they went with the P electric injectors common rail system, these injectors can deliver up to five injection events per combustion and it’s amazing technology because this is what gives the diesels their quiet running, lower emissions, less smoke, yeah it’s amazing. They’re powerful; they’re peppy so Volkswagen auto group which includes Audi and Volkswagen, they’ve always made good deals for decades. They’ve also sold a lot of them in the North American market and it’s not a particularly favourable market for diesels, for some reason people in North America don’t really like diesels which I’ll go into in a minute but the only other manufacturer that seems to have had a consistent line of diesels in North America is Mercedes Benz. They too have made very good diesels for a long, long time but the thing in North America people traditionally don’t like the thought because they’re noisy; they blew smoke, they stink, the fuel is more challenging to find, not as many stations had it. The diesel engine did however have a couple distinct advantages, excellent fuel economy and simple maintenance. If you go back a few decades cars require regular tune-ups, the diesels didn’t. In Europe diesels have been very popular because fuel been much more expensive so people looked for economical alternatives. Times have changed, our fuel is much more expensive, maybe not at the moment but it’ll get back up there unfortunately at some point and the diesels have evolved, they’re quiet, they don’t stink, there’s no more clouds of smoke and Volkswagen which has always been at the forefront of diesel cars was a perfect choice for people wanting to buy diesels because they’re well developed and they make good cars. Mark: So that’s a great bit of history but let’s talk about what you know best, repairs, service, what happens to these engines? Bernie: well as I mentioned diesels have evolved but the maintenance requirement have really stayed the same and this is true for TDI’s as well as other diesels. Of course oil filter changes are required; fuel filter changes and air filter changes, and these are really all that you need to do on a diesel. The only difference with TDI’s, VW diesels they all use timing belts so they need to be changed at the recommended interval. Maintenance at the prescribed interval is really important on any engine but especially with diesels. Anything like a drop of water that gets into the fuel injection system, if it gets into the injectors, injection pump just wreaks havoc and it’ll cost a fortune to fix so you want to make sure that never happens so changing fuel filters religiously is important and I mentioned TDI’s use timing belts, if they break catastrophic engine damage will occur, so you need to make sure you change the timing belts at the prescribed intervals. There are various intervals for different engines so you need to consult the Volkswagens specs to find out when to do yours. So what goes wrong with TDI’s? Overall they’re really reliable; they have some glow plug issues. Occasionally we’ve had issues with turbochargers, now many times it’s not actually the turbocharger itself but they use an electronic actuator in a lot of turbochargers. The actuators go bad; it’s all a one piece unit so we have to buy the turbocharger which makes for a kind of pricey repair. Fortunately for the Volkswagens they’re not too expensive when compared to Mercedes and other brands. Another thing that happens in TDI’s is pretty common over the history of the vehicles is that they get carbon deposits in the intake system, sometimes so bad that you can’t even, the engine will barely run up a hill so it’s a matter of carving it out, it’s time consuming but not a huge job. That’s basically the problems I see with TDI’s. Mark: So I already own a TDI Jetta and I love, it’s my second one, I love the car. Do you recommend them? Bernie: Absolutely, they’re great cars and TDI’s are offered in a variety of different VW and Audi vehicles so you can go with a Jetta, it’s a more economical car, and you can go with an upscale Audi so there are a variety of vehicles you can have that engine in. They’ve always been reliable, you know and that’s really important when you buy a diesel, you don’t want to buy a crappy diesel. A few decades ago the Americans rushed and brought out a few diesel engines that were just absolute junk and there are some other ones out there that are not so good, so you want to buy a good diesel because the cost a lot to fix. One advantage of diesel is the direct fuel injection system and now a lot of gasoline powered cars use direct fuel injection so the fuel economy advantage they used to get with the diesel not quite there as much and there’s gasoline is creeping up close so if you’re looking to buy a new car and you’re thinking of a TDI, you might want to crunch the numbers, look at the prices and see if you want to do it but overall if you’re looking for a good diesel vehicle definitely highly recommended Volkswagen TDI and if you own one, we’re happy to service them to. We lots of work on them and we can fix them well. Mark: Great, so we’ve been talking with Mr. Bernie Pawlik of Pawlik Automotive. They’re a 12 times voted best auto repair in Vancouver by their customers. So if you want a trusted place to get your sweet babies looked after, this is where to take them. Give Bernie a call at 604-327-7112 or go their great website pawlikautomotive.com. Thanks Bernie. Bernie: Thanks Mark, we’ll talk to you again soon.